4.1 How Much Power Does Your Garage Heater Need? 8 Is it Safe to Use a Propane Garage Heater? 9 Does an Electric Garage Heater Have to be Hardwired? If you are looking for a way of keeping your garage warm whilst you are working in there, you will be able to benefit from purchasing garage heater. 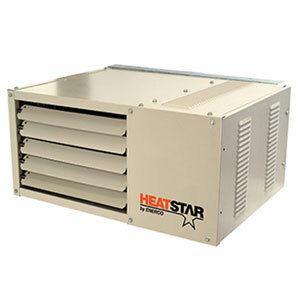 These heaters are designed to produce a lot of heat in a relatively short amount of time. Depending on the size of your garage, you will need to make sure that you are choosing a heater that is suitable. 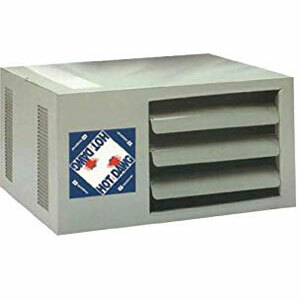 These garage heater reviews will give you an insight into the kind of products that are available for you to purchase. By using our reviews and are useful buying guide, you will be able to find the best electric garage heater for your needs. Read on to find out all about garage heater safety and other important aspects of these useful heaters. You will also find some great advice to bear in mind when you are considering purchasing one of these heaters. 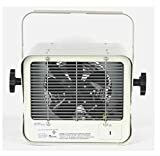 If an electric garage heater is not possible in your garage due to a lack of an electricity supply, for example, you should consider purchasing this Mr. Heater F232000 MH9BX. 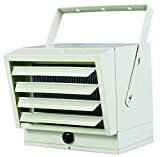 It is a heater that is perfectly safe to use indoors whilst it will provide you with a good amount of heat whilst you’re working in the garage. For areas of up to 225 square feet, this heater will be able to provide between 4,000 and 9,000 BTU of comfortable radiant heat. If you position the heater so that you will be on the direct path of the heat, you will be able to enjoy the maximum benefits. There is an integrated auto-shutoff feature that is built into this heater. It will ensure that if the heater is tipped over, it will turn off straight away. It will do the same if the oxygen levels drop too low or if the pilot light goes out. Whilst some people may believe that they need a high-powered propane heater with plenty of BTUs to heat a space such as a garage, in actual fact, you’ll find yourself opening windows for ventilation and letting a lot of the heat escape during this process. Instead, you should choose an electric garage heater such as the Fahrenheat FUH54. It offers far fewer BTUs than your standard propane heater, but there are no unpleasant fumes or gasses and you won’t need to open any windows so you’ll benefit from 100% of the heat. This heater is easy to install and comes with a mounting bracket to allow you to mount it to the wall or ceiling. You can also direct the heat in any direction that you wish by simply rotating it on its mount. 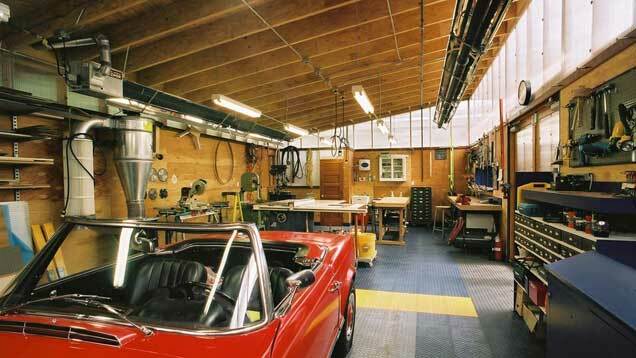 A thermostat is included, which is good at regulating the temperature in your garage. You will be able to enjoy constant and comfortable temperature when you need it. Although this heater does have a fan in it, it is not particularly noisy and it won’t be an annoyance when you are working in your garage with the heater on. If you want to have as much flexibility as possible when choosing the mounting type for your heater, you should consider this ceiling mounted industrial electric heater. You will be able to install this heater with ease. It comes with a ceiling mounting bracket so that you can mount it to provide vertical or horizontal heat flow. You can also twist the heater into any position that you require so that the heat is directed to the most used part of your garage. To prevent this heater from corroding whilst it is in the Cold and potentially damp atmosphere of your garage, the casing is finished with an epoxy coating. This is highly water resistant and will prevent it from becoming rusted or corroded. In order to protect the parts of this heater whilst, it is in operation, an automatic shut off is included to prevent overheating. This ensures the maximum possible durability from this heater. One of the main setbacks of this heater is that its does not come with a thermostatic Control. This means that you will not be able to set the temperature of the heater so it can either be on or off with no in between. With up to 13,000 BTU heat output, this heater is perfectly capable of heating a good sized garage with ease. You can also choose from 950 to 5700 watts when you install it so that you can be sure that it will be safe to use on your electric circuit. With multiple heat settings and a 270CFM blower, you will be able to enjoy the maximum benefits from this heater. It does not come with a remote control, however, so if you want to be able to control it easily it is a good idea to install it in a location where it can be reached when needed. For safety, this heater comes with a thermal cut off. This ensures that the heater does not get too hot and is not only safer for the user, but also means that the parts in the heater will not become damaged due to excessive temperatures. If you are not going to be mounting this heater, you can be sure that it will still be safe to use in your garage as it features an anti-tip-over sensor. The motor is made from cast iron and is permanently lubricated so that this heater will require less maintenance. 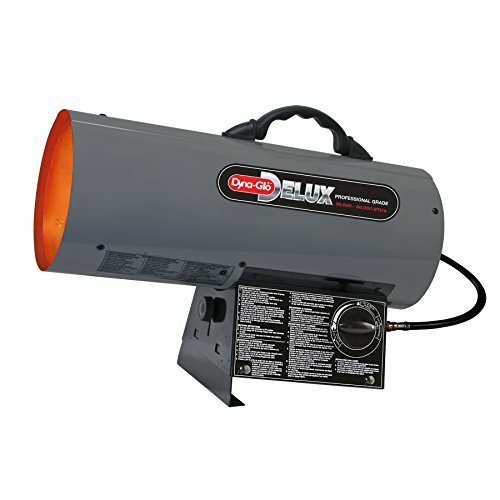 This durable heater offers you versatility when heating your garage. It features an adjustable thermostat so that you can set the heat output of the heater with ease. Choose from high or Low heat settings, which offer a power of 6000 or 3000 watts. This is a heater that is designed to be hardwired into your main electric supply. You could also fit this garage heater with a plug and plug it into an outlet, but you must make sure that the outlet has enough power to safely operate the heater. You can mount this heater to the ceiling or the wall as it comes with a bracket to allow you to do this with ease. 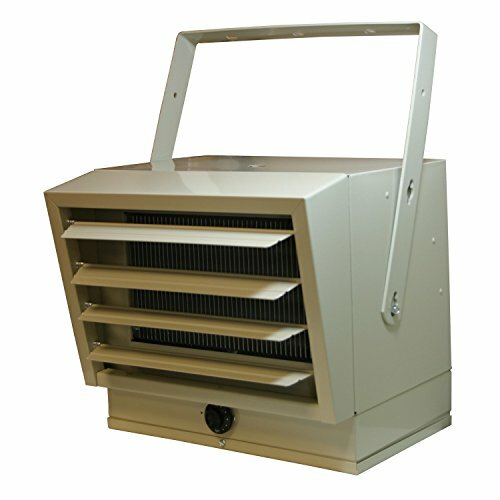 It also features 5 louvers at the front, which can be adjusted to direct the heat flow in any direction that you wish. The heater itself is quiet when it is running despite using a fan to distribute the heat around your garage. It also spreads the heat smoothly so you can enjoy a constant and steady flow of warmth around your garage. The ball bearings of the motor are heavy duty and are permanently lubricated for reduced maintenance. The heater also comes with a 1 year limited warranty against parts and labor. This liquid propane forced air heater is the product of great workmanship. It features a split capacitor motor, which will provide you with the most reliable operation out of any heater motor around. This is a durable and highly efficient motor offering the best performance. The Dyna-Glo heater has a 0.5-PSI pressure system and this delivers the highest possible BTU heat output, even if the environment is unfavorable. Heaters that operate at a higher pressure are not as capable of outputting such high amounts of heat and the tanks are susceptible to freezing in the colder weather. They are also known to leak, which can be dangerous. To ensure the maximum durability, this heater comes with a brass nozzle. This makes the nozzle virtually indestructible and far more superior to their stainless steel counterparts. The motor in the Dyna-Glo heater is mounted to a sturdy bracket and in turn, this is fitted well to the lower part of the heater’s chassis. Whilst this is a more complicated and expensive way of attaching the motor, it has been proven to be better for the heater. Motors that are attached at the back can cause the fan to become damaged and misaligned. As a result, the construction of this motor is far more effective. Heats : up to 1000 sq. ft.
Heats : up to 1250 sq. ft.
Heats : up to 750 sq. ft.
Heats : up to 625 sq. ft. Warm garages make you feel comfortable when you pick your car for work, and also it is very good for your automobile. This garage heater doesn’t use electricity but gas (natural or propane). Nowadays many households prefer this kind of energy because it saves you a lot of money. The HD45AS0111 by Modine works quietly, without annoying you with noisiness. It is not with a fancy design, but this is a heating unit for your garage, not for your living room. It comes in a neutral color pattern and a low profile design. Since this heater is certified, you can use it for industrial, commercial and residential needs and not only in your garage. The installation is easy and you can mount this gadget in 2 hours by using the owners manual. This unit contains pipe holes on the left or right side, but there aren’t any pipes included in the box. You would need to buy a small-diameter pipe. It is projected for wall or roof installation. 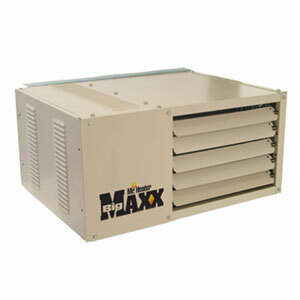 This big boy easily heats a 2- 3-car garage with its 50,000 BTU per hour powerful motor. 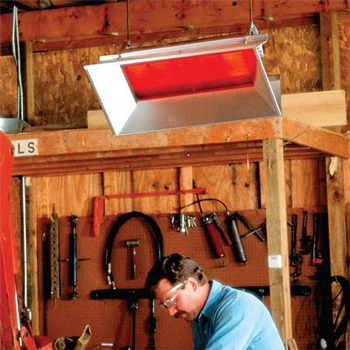 As most garage heaters, this one too is with a low-profile, and you can mount it just 1inch off the ceiling. 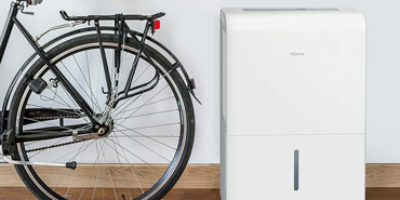 It uses neutral gas, and in that way, it saves you money and heats spaces from 700 sq.ft. to 1250 sq. ft. For this reason, the unit needs only the normal 115V AC circuit. This heater pulls the cool air from outside, heats it and then blows the hot air inside. You want to install it in such a way that you can access and control the thermostat, the A/C terminals and the gas connection easily. You could install it vertically or horizontally. One of the good things is that Mr. Heater company gives you a 3-year warranty, which covers all parts and also a 10-year warranty for any other defects. Something important to note is to not store or use flammable gases and liquids in the area of this unit. We are sure you know why. Let’s start with its 50, 000 BTU/hour motor. It uses natural gas and heats up the air in rooms up to 1,250 square feet. This unit doesn’t take air from outside, it only circulates the air inside the room. There isn’t any intake pipe and that’s why the installation is even easier. It is big – 25 x 12 inches and it weighs 63 lb. A feature we are sure you would like is the self-diagnostic control. This is a module where you don’t need to check the unit or maintain it, the device will let you know if there is something wrong. When you are installing it note that it must be located at 8 ft distance from the floor because the front side of the unit becomes really hot, and it is good to think about preventing sticking someone’s hand into the heater and getting burned or cut. As the other heaters are, this one is with low profile design too, so it is convenient for ceiling buildings. The F299735 motor is 30,000 BTU and again, works with natural gas. This unit is a garage vent free heater. It could be used for heating your place or garage during the cold seasons. The device is really durable because of the metal heat shield. This heater has a thermostat for superior control of the temperature. Also, includes a battery powered electronic ignition (where the batteries are included), and starting it is a breeze. You can permanently put it on the wall or to the floor with a mounting bracket and fasteners (which are included too). It circulates the warm air around the room keeping your tools, men’s toys or car warmly. We assure you that thanks to its Oxygen Depletion Sensor, one of its features, you will breath fresh and warm air. On the downside, you can’t purchase it in Canada or California. Another interesting function here is that when this heater works at altitudes over 4,500 FT above the Marian level it could shut down. Did you have a situation where you can’t start the car because it is too cold, and there are power outages, and your electric heater doesn’t work? Well, this. Heater MH25NG can be your lifesaver during the cold season. This unit has 25,000-BTU power motor with natural gas. Its design is very clean and it operates quietly, what else can you want? Also, the installation is very easy. Note that it is good to mount it within 18 inches of distance between the top side of the gadget and the ceiling. The heater has a thermostat for comfort controlling the temperature inside. An advantage is that there isn’t any electricity needed, so your bill will be constantly the same. The unit can heat a 625 sq.ft. room or 2 or 3-car garages. About the safety features, the heater has an automatic safety shutoff. Mr. Heater gives you a one-year limited warranty. This heater’s motor is 25,000 BTU per hour. You can use it in your garage for keeping your cars warm. It can heat rooms from 500 to 600 sq ft, which is equal to 2 or 3 garages. ft Again this unit doesn’t need electricity, which is very good for situations of a power outage. The installation is pretty simple if you use the owner’s manual. There is a millivolt thermostat (included) and you must set it up with a wire, but note that you must buy an appropriate wire because it isn’t included. Then, you can mount the heater on the wall and set up the gas connection. That’s the whole ordeal. It has a clean design, a lot of safety features, and whenever you need it, it is there. The device is made of non-corrosive parts, that’s why it is really durable. One big advantage is that with this device there aren’t any odors. We don’t recommend you to use it in rooms where you sleep, mobile homes etc. If you are looking for the best garage heater for your garage or workshop, you may be feeling a little daunted at the choice that is available. It is true that there are hundreds of models out there to choose from, but there’s no reason why choosing the right one for your needs should be so difficult when you know what to look out for. The first thing that you’ll need to do is find out what types of garage heater you can purchase. There’s more than just one style, so it’s important that you pick the one that will be able to provide you with enough heat depending on the purpose that you need it for. These garage heaters have an integrated fan and they are easy to install. 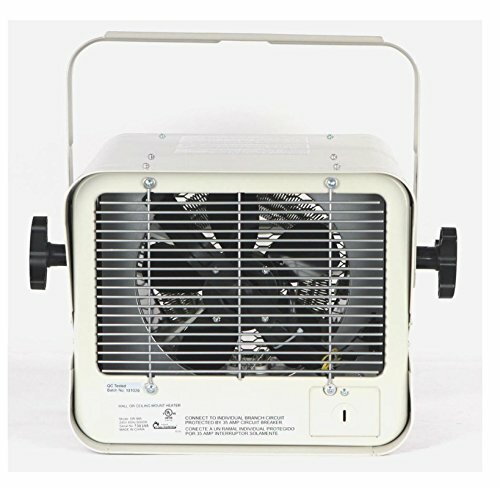 They are possibly the most popular garage heater type. Electricity is converted into a heat and then a fan draws in cold air from the garage and then blows it out once it has warmed up over the heating element. They can heat the room quickly and produce a lot of heat. 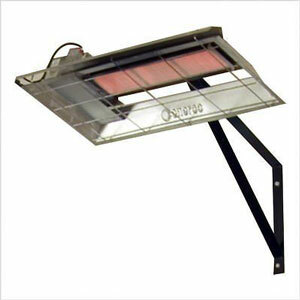 A radiant or infrared style of garage heater directs heat forwards to objects that are close by. They work in a similar way to the sun so they also provide a more comfortable heat than fan forced heaters. The problem with these heaters, however, is that you need to be fairly close to them to enjoy the benefits so they’re not as popular as the fan forced heaters. These kinds of heaters are powered by fuels rather than electricity. They can heat up a garage very quickly and as they don’t require an electricity supply, they are highly portable. Although they are great for heating larger areas, you should take care with one of these kinds of heaters, as they can be dangerous to use in an enclosed space. $$$$$ 26 x 12 x 16.5 60 pounds 45,000 BTU up to 1000 sq. ft.
$$$ 25 x 18.5 x 17 70 pounds 50,000 BTU up to 1250 sq. ft.
$$$$ 25 x 12 63 pounds 50,000 BTU up to 1250 sq. ft.
$ 27 x 11.2 x 26.5 26.8 pounds 30,000 BTU up to 750 sq. ft.
$$ 10 x 28.5 x 13 3 pounds 25,000 BTU up to 625 sq. ft.
How Much Power Does Your Garage Heater Need? When you purchase a garage heater, it will give a power rating in the form of BTU. The higher the watts and the BTU of the heater, then the more powerful the heater will be and the larger the space that it can heat. You should remember that the given power rating usually refers to the best possible conditions, so you should take care to purchase a heater that is a little more powerful than you actually need. This will allow for any draughts or poor insulation too. 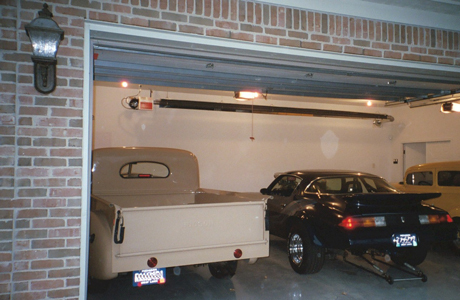 Smaller garages would benefit the most from a radiant or infrared heater. These kinds of heater work best in smaller spaces and because they heat objects rather than air, they don’t really lose heat to ventilation ducts or draughts. 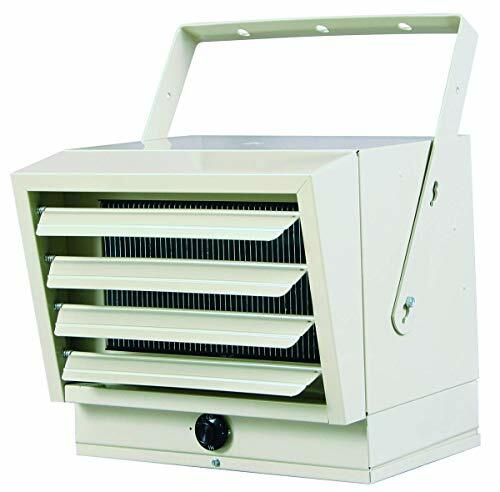 You could also purchase a medium sized fan-forced heater for smaller garage spaces too. A 1.5kw fan-forced heater would be better for smaller garages, but if you have a larger space, you should consider purchasing a heater of around 4,000 – 5,000 watts. Remember to consider the height of your ceiling. If you have a garage with a particularly tall ceiling, you will certainly need a more powerful heater. When you purchase a garage heater, you should know whether it would stay in the same place all the time or not. 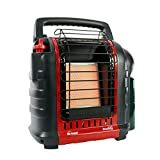 If you want a heater that you can take with you from one workshop to another, or even if you simply want to move it around the garage, you should consider purchasing a portable heater. These can be easily transported from one location to another and you simply need to plug them into an electrical outlet. If you want true portability with freedom from electrical plugs, you could even choose a fuelled heater instead. If you don’t need to move the heater, you really should think about getting a fixed heater. These are wired into your electrical circuit and fixed in place, usually higher up, but they can be fixed closer to the floor if you wish. There are many benefits to choosing a fixed heater as you won’t need to worry about finding somewhere safe to stand it, you can’t accidentally knock it over and you can have more space in your garage, especially if it is fixed higher up. When you purchase your garage heater, you should be sure that there would be enough safety features to keep you safe whilst you are working. – It’s not uncommon for things to get knocked over when you are working in the garage, so getting a heater that has a tip over switch is essential. If the heater is knocked over, it will automatically turn itself off. – As you’ll have the heater on for prolonged amounts of time, it’s likely that every so often, it will become too hot to function. Overheat protection will ensure that the heater turns itself off to protect itself from high temperatures causing damage to any of the heater’s internal parts. – When you have a heater that is on a table or floor, the last thing that you want is for it to get too hot to the touch. Whether there are pets, children or even adults who aren’t thinking that the surface of the heater may be hot, heaters that get hot whilst they are in operation are dangerous. Look out for cool-touch heaters for maximum safety. When you buy your garage heater, you’ll want to ensure that it comes with all the features that you could possibly need. When you buy a heater, the more customizable it is the better, as you’ll get the best possible use out of it. If you have a very basic heart, you’ll have problems like only having one heat setting and the heat could also be directed in the wrong way so that you don’t even benefit from the heat output. Adjustable Louvers – In order to let you direct the heat to where you want it to go, you should look out for a garage heater that has adjustable louvers. Power Cord Length – When you get a garage heater, you should ensure that it comes with a long enough power cord to allow you to place it wherever you need to in your garage. It can be difficult to find an extension lead that is safe to use with high power output heaters so it is especially important that the power cord that comes with the heater is long enough. Carry Handle – If you are choosing a garage heater that is portable, you should ensure that it comes with a carry handle to allow you to pick it up and move it with ease. Although it is not an essential feature, it will make things easier for you. Wheels – Wheels and castors are useful to have a garage heater, as they will allow you to move the heater without the need to lift it. As garage heaters need to be more powerful than other types of heater, they are often heavier with larger elements. Lifting the heater can be bad for your back, so being able to wheel it on casters is a much better option. Whether you want to use your garage to fix your car in the winter, or if you simply want to use your garage as an exercise room or gym, You will need some way of making it warmer in the colder months. This is a short guide will give you some advice on keeping your garage warm whilst observing important safety rules. First of all, you should consider I fixed heater for your garage. 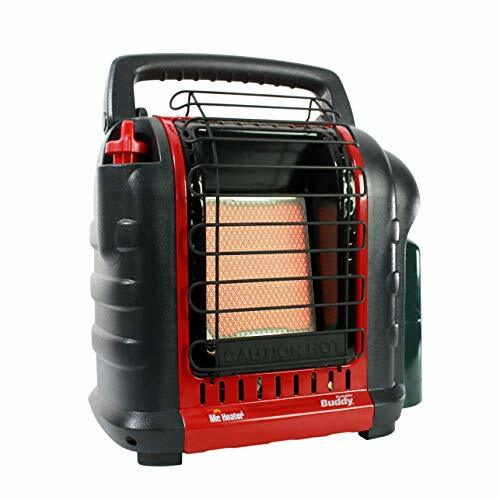 Portable heaters can be very dangerous as they are easy to take over and often use flammable fuels. You can also find that some materials that you using your garage including gasoline, spray paints, and what can results in by is being caused by portable heaters becoming too hot. Some of the best kinds of garage heaters include vent-free, sealed combustion and electric radiant ceiling panels. You should try to avoid using lovely fun style heaters, as they tend to be a little less capable of heating largest spaces. You should try to position your heater away from the floor or any work surfaces that you are going to be using. A freestanding heater is probably not the best idea as this is likely to get in the way of your exit route or it could be knocked over. This is especially likely if it is on a table top. Instead, you should mount your heater on the wall all the ceiling. 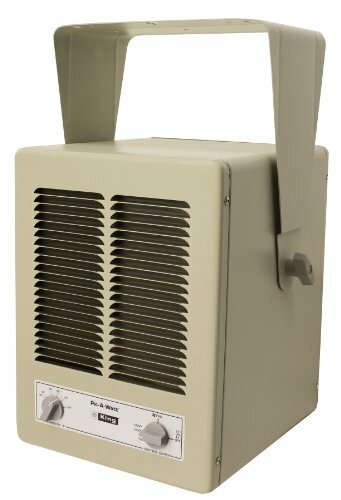 Many garage heaters allow you to direct heat as you need to. A good idea is to ensure that their heat flow is pointing towards the center of the garage, or towards any workbench area where you may be working. This will mean that you will get the maximum benefit from the heater. A radiant panel may be a good idea too, as these can warm up your garage and help it to stay warmer for longer. They do take a little while to heat up so you will need to be patient. In order to keep your garage toasty and warm throughout the winter months, you’ll need to ensure that it is adequately heated. Often, the first thing that most people may think of when they consider heating their garage is simply purchasing a garage heater. Whilst this will provide some heat, there are a few other things that you could do to help your garage to stay warm. Insulate – the first thing that you’ll need to do is prevent any heat from escaping from the garage. 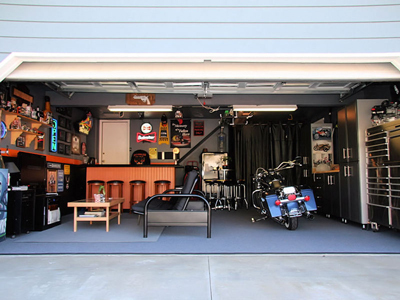 Garages are not built to be warm, so adding insulation will ensure that there is no draught. Some people find that simply stopping the heat from escaping from their garage is enough to keep their space warm enough to forego having a heater. Use a high-quality type of insulation on the walls and the ceiling. Choose the right heater – when you choose the heater for your garage, you should ensure that it is going to be effective in heating up your garage space. This means that you will need to measure the size of your garage and decide on how quickly you’ll want the garage to heat up. You should also bear in mind that some garage heaters require ventilation. Installation – You should make all the necessary installation plans for your heater, including hiring a contractor if you need to have a hardwired electric heater installed for example. Check the windows and doors – remember to ensure that the windows and the doors in your garage are also well insulated. Gaps around the door and window frames are likely to cause droughts and will enable the heat to escape outside. If there are any gaps, you should use some sealant or caulk to fill the gaps well. This will keep more of the heat in and will help to lower the heating bills. Firstly, you should install outline of sheathed cabling from your main Electric box to your thermostat unit. Now you should take the cable from the thermostat and run it straight to the location where you want your garage heater to be installed. Use two screws to secure a junction box to the location where you wish to install the heater. Ensure that you pin the cable in place using electric cable straps or clips. You should make sure that your circuit breaker has been turned off. Remove the panel cover from the circuit breaker and install the double circuit breaker. Use wire strippers to take the sheathing off the cable that is in the panel box. Connect the ground to the bus wire. These should go on the terminal lugs on the breaker. It is important to remember that the breaker lugs will still be live even when the electric breaker box is turned off. You should take extra care not to touch these lugs. Color the wires so that they match regulations in your area. In order to fit the thermostat, you will need to remove some of the sheathings from both ends of the cable that aren’t leading to it. Again, color each of the wires so that they meet your area’s regulations. Locate the wires that are labeled line or L1 and L2 and then ensure that you attach both wires that lead to the circuit breaker. You will need to use wire nuts to cap the connections. Attach the ground wires to the thermostats ground wire, which should be colored green. Screw the thermostat onto the wall. Attach the cable to the junction box by removing some of the sheathings first. There should be 1 pieces of black insulated wire and one of green insulated wire that is run through the conduit. You should ensure that see you strip around an inch of the wires from all the wires that are in the junction box in the ceiling. There should be five wires. The black wires need to be twisted together. You then need to cap these wires with a wire nut. Color the wires to match your local regulations. Cap the wires with a wire nut once you have twisted them together. Put the cover back on the box. Locate the black heater wires and connect them to the black supply wire. You should connect the green wires together for ground. Put the cover back on the junction box and ensure that it is secured. It is important that you read the manufacturer’s instructions and follow these to install your new garage heater correctly. Make sure that you follow up to date wiring guidelines. If in doubt, you should always hire a professional. Is it Safe to Use a Propane Garage Heater? Using a propane heater in your garage can indeed be safe. There are, however, some things that you will need to consider before you choose this kind of heater for your garage. First of all, there must be enough oxygen in the space to allow the propane to combust properly. You should also ensure that you are not working with any flammable materials in your garage. If you are thinking of using things like spray paints or gasoline in your garage area, then it is advisable that you don’t use a propane garage heater. When you use a propane heater in your garage, you don’t necessarily need to keep the propane cylinder outside. Some propane tanks can be used indoors, although these do tend to be the ones that have smaller propane tanks. If you need a larger tank, then it is likely that you will indeed need to keep that outside. Even though you can use a propane heater in your garage, you should make sure that you look at all the other options before you make your purchase. There are plenty of heaters that are actually designed for use in the garage. If you have an electric supply, for example, you’ll probably get better results and more energy efficient heating from an electric garage heater. Does an Electric Garage Heater Have to be Hardwired? If you are purchasing an electric garage heater for heating your workspace, you should ensure that it is being installed correctly. It is difficult to say for certain whether or not your garage heater should or should not be hardwired into your electric supply. 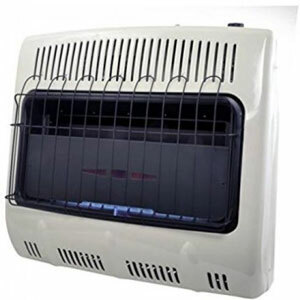 That’s all depends on the model of heater that you purchase. Some of these garage heaters are intended for permanent use in the same place. Those units are usually hardwired into your electric supply. On the other hand, there are other units that are designed for you to plug them into an outlet. Although you will get the same kind of heat from both kinds of Peter, the hardwired garage space heaters require installation by a certified electrician. You should check the item description when you are purchasing your heater to see whether it will need to be installed directly into your electric supply, or whether you can simply plug it into an outlet. Before you have the heater installed, it is a good idea to have an electrician check the voltage output of your electric supply. 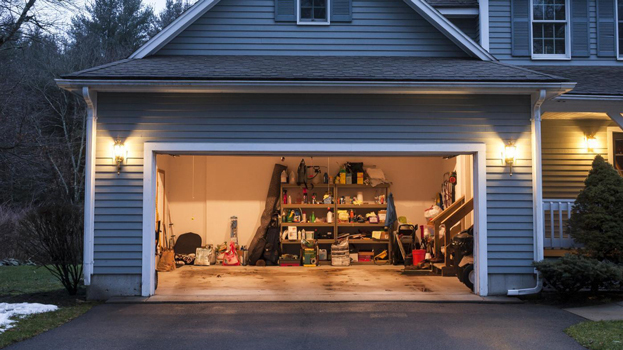 Lots of garages are fitted with a standard high-voltage electric supply but some of them use the lower voltage that is required for a lighting circuit. It would be dangerous to connect a heater to this kind of circuit. 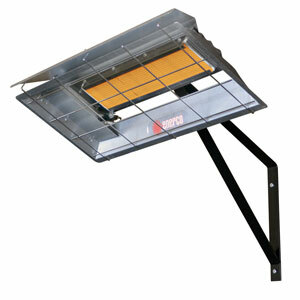 Garage heaters are a great choice for your workspace no matter what you use it for. They provide heat in the colder winter months when you need it the most and not only do they help to keep you warm, but they can also act as a way of keeping your garage and the things inside it from becoming damaged by frosty weather. These garage heater reviews have undoubtedly given you some great ideas when it comes to choosing the best electric garage heater for your needs and we hope that our buying guide and our answers to some frequently asked questions will help you to make the right decision. Don’t forget that there are other heaters besides electric ones for you to choose from, but in general, you will find that electric garage heaters are the safest type. If you already have an electric supply in your garage, you will be able to choose one of these kinds of heaters.